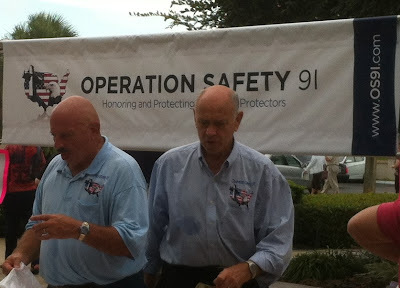 Operation Safety 91 had the honor and privilege of attending the Fellowship of Christian Police Officers (FCPO) Annual Conference http://www.fcpo.org/ in First Assembly Church, Deland, FL http://firstassemblydeland.com/ yesterday and today. Over one year ago we were connected to FCPO when I cold contacted the FCPO Florida head, Deputy and Chaplain Mike Dye of Volusia County Sheriff's Office. I will never forget when Mike returned my call and asked where OS91 was located. I responded, "Winter Garden, FL." 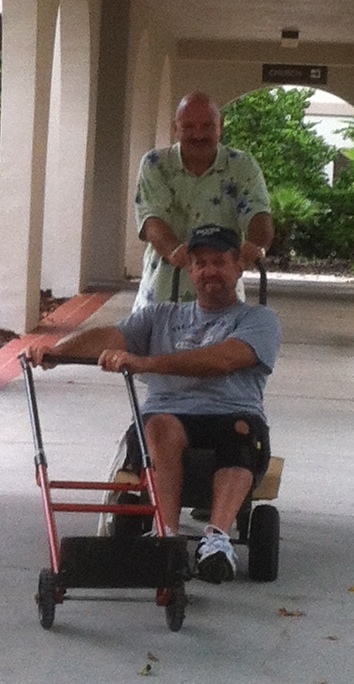 Mike said, "We're in Deland!" The rest is history! Ed and I met with Mike and loaded him up with Psalm 91 cards and the the 1687 Foundation's Psalm 91 resources, both of which he eagerly accepted to distribute. So about 3 months ago, when Mike contacted us inviting us to the annual Conference, the dates went on our calendar immediately. And what an outstanding Conference it has been! 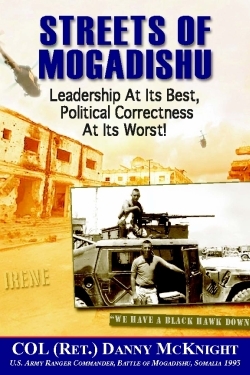 COL held the audience of Responders by the heart as he spoke of current events, his two trips to Afghanistan during the past 12 months, the Battle of Mogadishu, Leadership principles and his book: Streets of Mogadishu - Leadership At Its Best, Political Correctness At Its Worst. "Leading soldiers in combat is a special privilege; someone has to do it and I got to do it!" COL states that "you manage things: you lead people!" "In this day and age, most people are followers; we must 'take a stand' and lead people". COL ended with his personal testimony and allegiance to his leader, Jesus Christ! 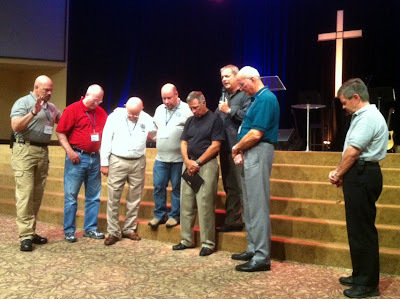 First Assembly Deland Pastor Mike Modica, served in the U.S. Army and truly appreciated hosting the FCPO Conference and COL Danny McKnight at the Church. Pastor Mike's son, currently also serving in the Army will be deploying to Afghanistan in months to come. Thank you, Pastor, for your service to God and country! Our most sincere congratulations to Chaplain Mike Dye of Volusia County Sheriff's Office for coordinating such an outstanding Event! 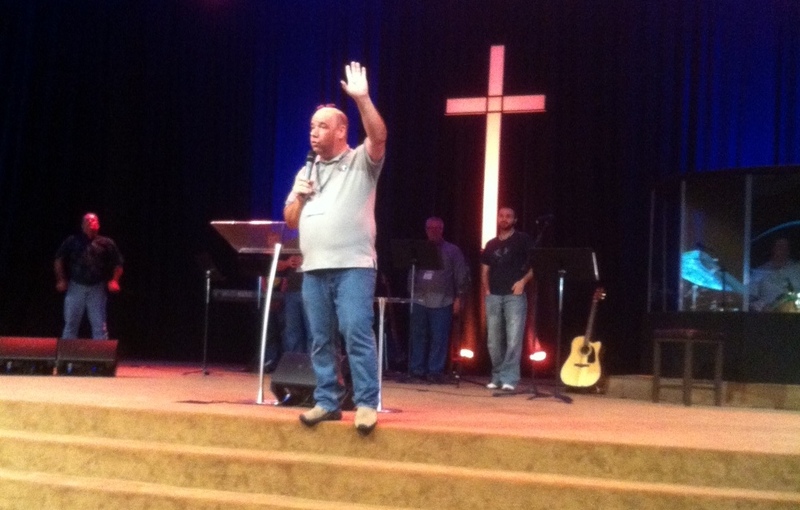 Behind Mike pictured above is a group of Responders who led excellent Praise and Worship during the Conference. 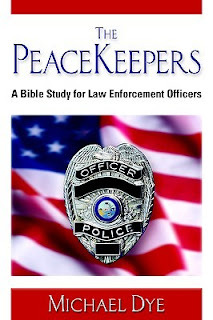 Mike is the author of a "must-read" for every LEO: "The PeaceKeepers - A Bible Study for Law Enforcement Officers". One of my greatest joys during this Conference was the moment I walked into the Vendor Room on Friday afternoon and there stood long-time partner of Operation Safety 91, Jonathan Parker, an officer with Chattanooga Police Department and Founder of Covered Law Enforcement http://www.coveredlawenforcement.org/. 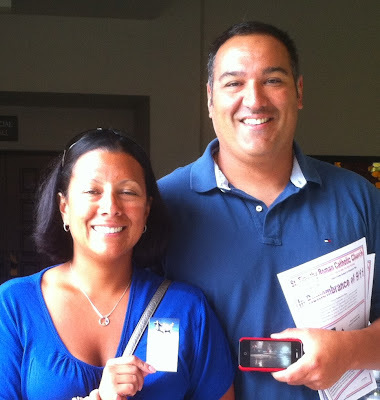 Jonathan has one of the most compelling testimonies: Meredith Parker Testimony 700 Club. Although Jonathan has been partnering with OS91, distributing Psalm 91 cards and the Psalm 91 books of the 1687 Foundation, we had never met. At this Conference, we not only met him, but had the opportunity to listen to this young Officer and Minister, on fire to reach Responders for Christ. 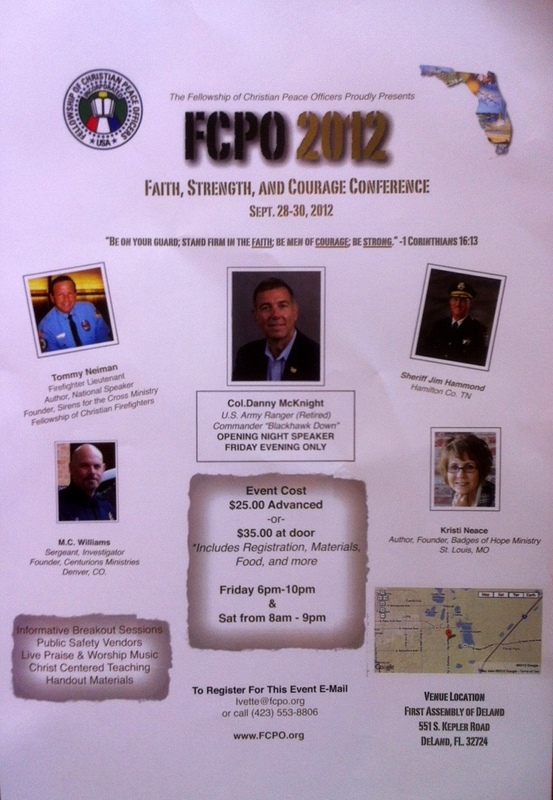 Another long time Operation Safety 91 partner who attended the Fellowship of Christian Police Officers Conference is Chaplain Ray Fairman http://operationsafety91.blogspot.com/2011/07/os91-partner-chaplain-ray-fairman-at.html. What a great reunion! Ed and I were invited to attend all talks and were inspired listening to MC Williams, FCPO Vice President and Board Member, among several other outstanding talks by current and retired Responders. OS91 gave out over 3,000 Psalm 91 cards during this Conference as well as several cases of Psalm 91 books for Military and Toddlers. And... to our great delight, we have been invited back to First Assembly Deland by Pastor Modica to speak to the congregation about OS91's mission and vision. 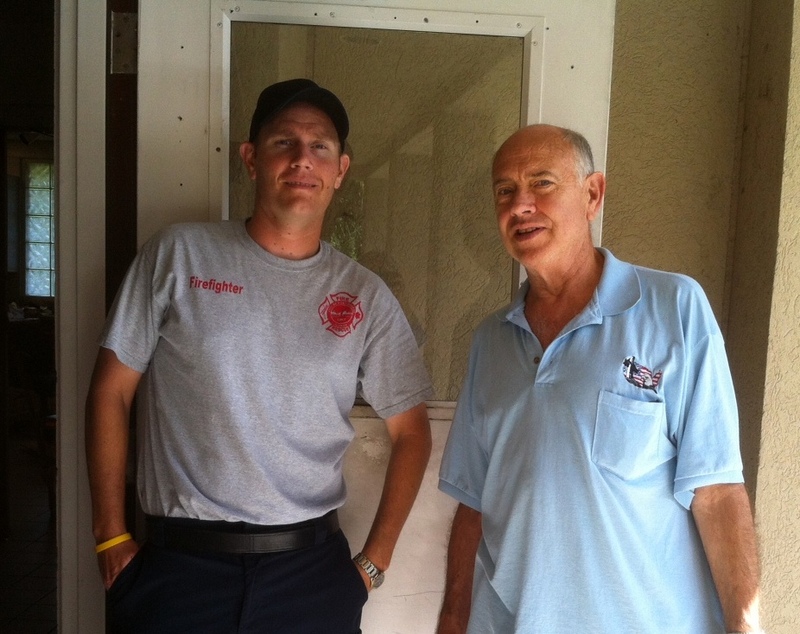 OS91 continues to move forward to reach more Responders with God's supernatural protection: Psalm 91. To date, OS91 has distributed over 350,000 Psalm 91 cards / 375,000 Psalm 91 cards have been made through donations so far. Thank you to our faithful God as well as to our partners! As we say: "Together we can do so much more than separately!" OS91 doing what we love! Operation Safety 91 was graciously welcomed today by Daytona Beach Shores Police Chief Stephan Dembinsky. 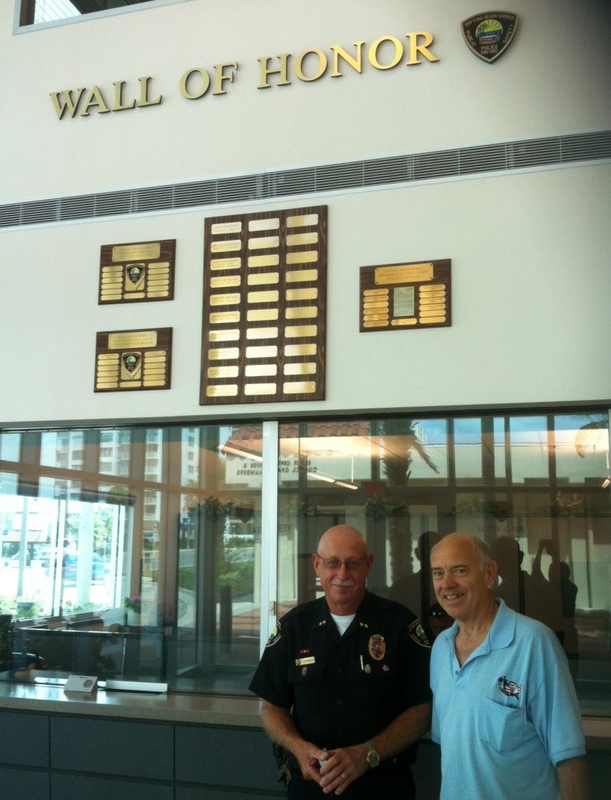 Chief Dembinsky has been a Police Officer for more than 35 years. 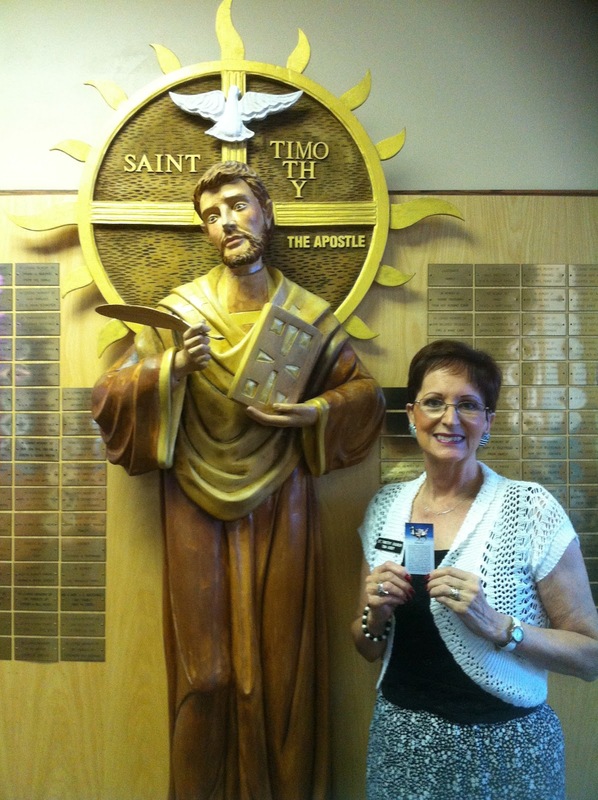 We left the gift of Psalm 91 cards for any Officers on the force who would like them. Chief thanked us more than once during our time together for Operation Safety 91's mission and vision to honor and protect America's Protectors. 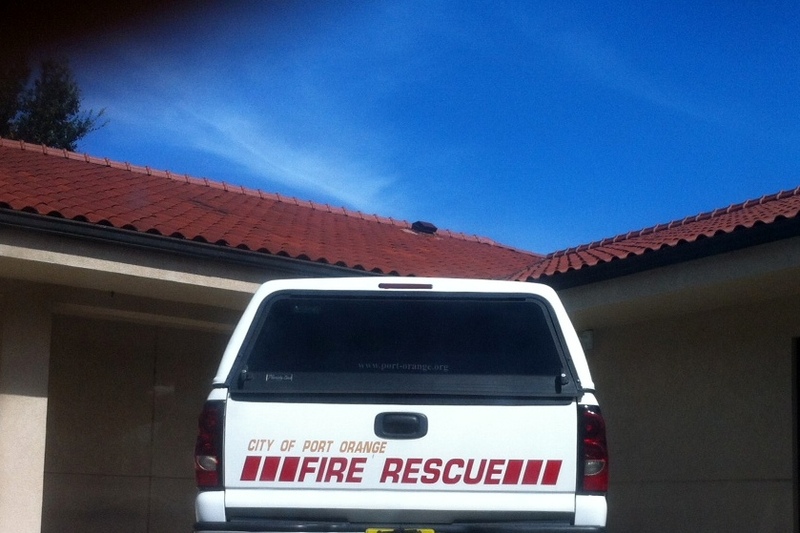 We also took some time to visit with a Firefighter at Port Orange, FL leaving some Psalm 91 cards for his Team located in the nearby station. 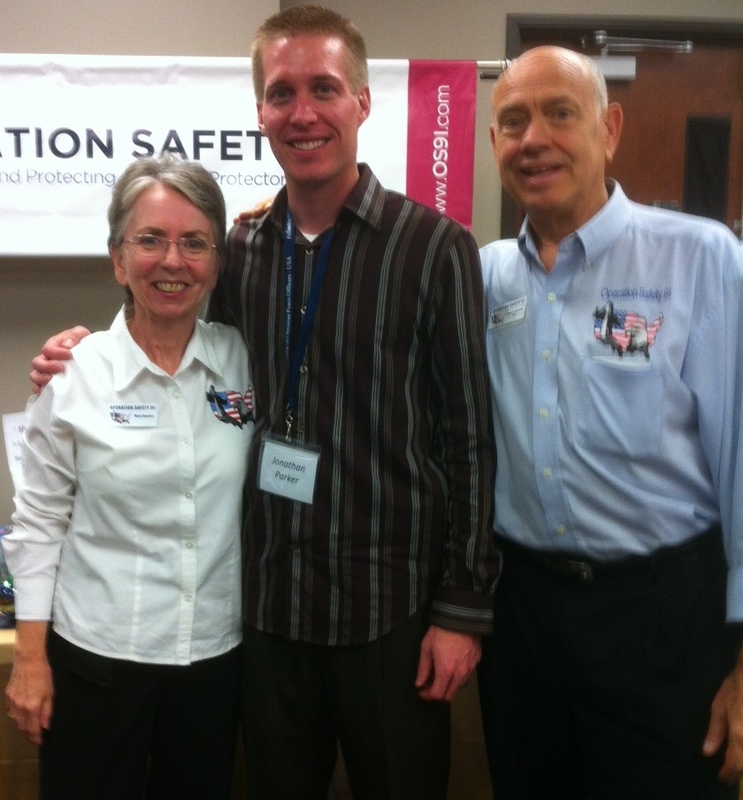 We appreciate all Responders and want you to be protected with the supernatural protection of Psalm 91. 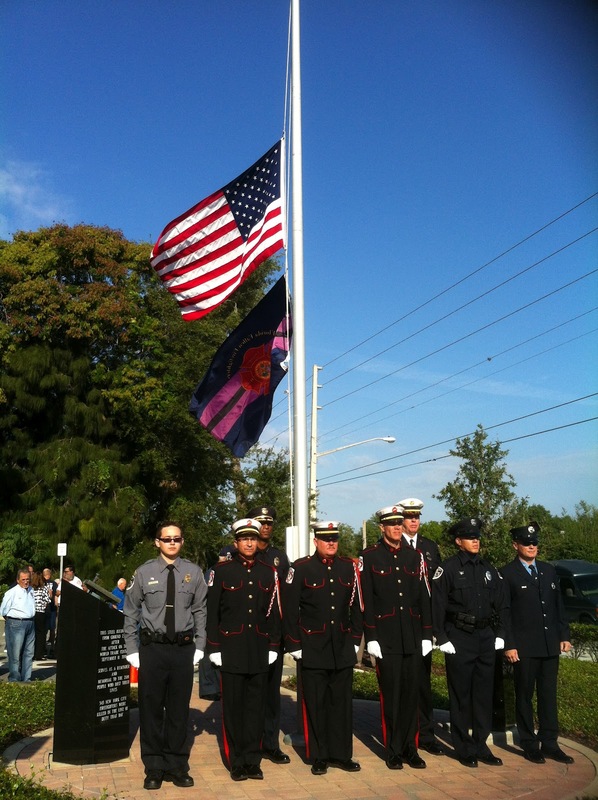 OS91 attended a 9/11 Memorial at Clermont, FL's Fire Station 1 on Highway 50 in Clermont. What a meaningful and touching Ceremony! 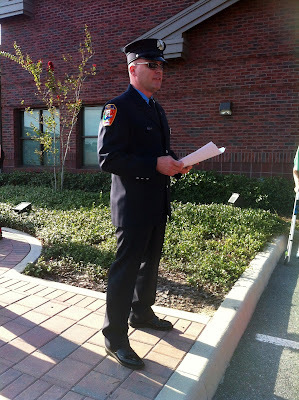 Guest speaker was OS91's very special friend, Jimmy Brown, member of FDNY who responded to the attack on the Twin Towers on 9/11, and survived the fall of Tower II, preserved miraculously by God's grace! 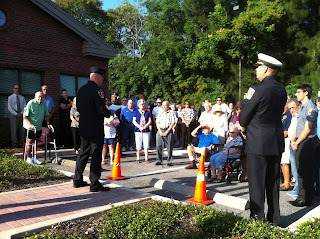 The crowd of former Responders of NY and patriotic citizens of Clermont gathered for the Memorial. Although Ed and I now reside in Winter Garden, Clermont was our original home in Florida, so it is very special to us. Speaking of "special to us", this Memorial brought us together with several longtime friends of Operation Safety 91: Clermont Fire Chief Carle Bishop and Clermont's interim Chief Charles Broadway. 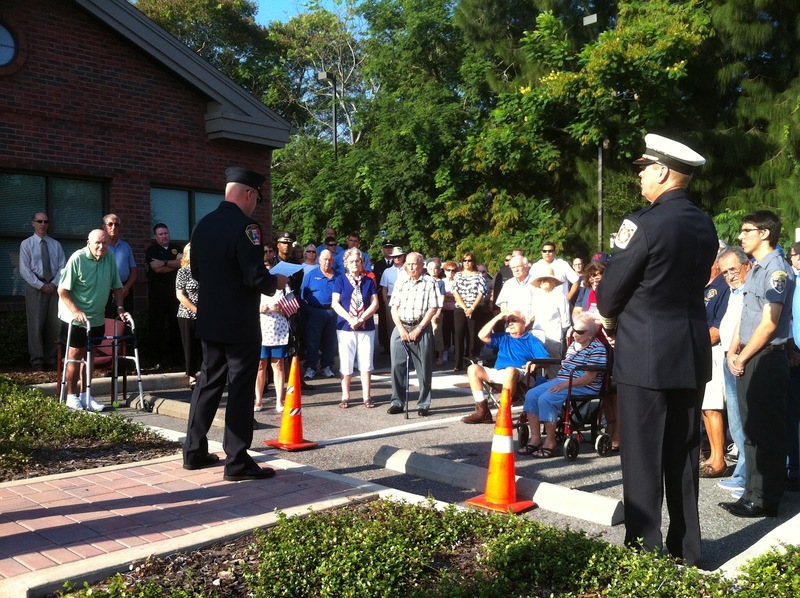 Longtime friend of Operation Safety 91, Fire Chief Carle Bishop, hosted the 9/11 Memorial with the help of Charles Broadway, who also responded to the attack on 9/11 as an NYPD Responder and who was recently promoted to Clermont's interim Chief of Police! Know that OS91 appreciates you and our prayers are with you both! 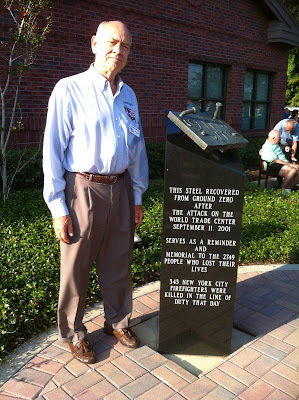 Special friend of Operation Safety 91, Jimmy Brown, former NYPD, then FDNY, invited Ed and Mary to share in this Memorial Ceremony. Jimmy shared the testimony of his miraculous preservation as he was almost buried alive in the rubble of the Towers, escaped, and is now a walking testament of God's supernatural protection! I don't know if there was a dry eye in the crowd...I couldn't see through my tears! OS91 loves you, Jimmy, and your dear wife, Shirley! You two are a blessing! OS91 salutes all the brave men and women Responders who went into the Twin Towers while civilians were going out... all who lost their lives to rescue as many as they could. 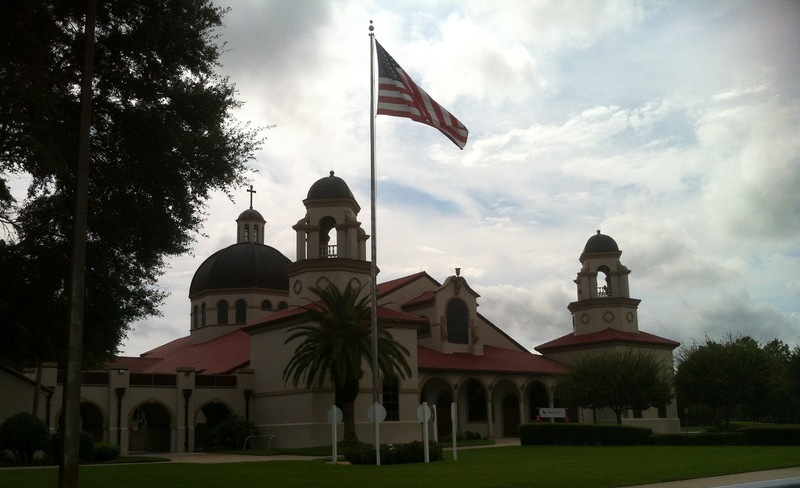 The weekend of 9/11, 2012 brought us to St. Timothy's Catholic Church of Lady Lake, FL for a fundraiser for Operation Safety 91. Father Ed Waters, Pastor of St. Timothy's, not only graciously opened his doors to us, but his heart as well. 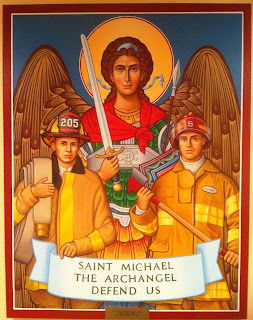 St. Timothy's is a very patriotic Church, full of retired Veterans of all branches of the Military, many NYPD and FDNY Retirees and all other Responders. One look at the vehicles (including golf carts) with their stickers, magnets and U.S. flags will tell you that these people are true Americans! Prominently displayed on the front of St. Timothy's Church is a wonderful salute to our Armed Forces. 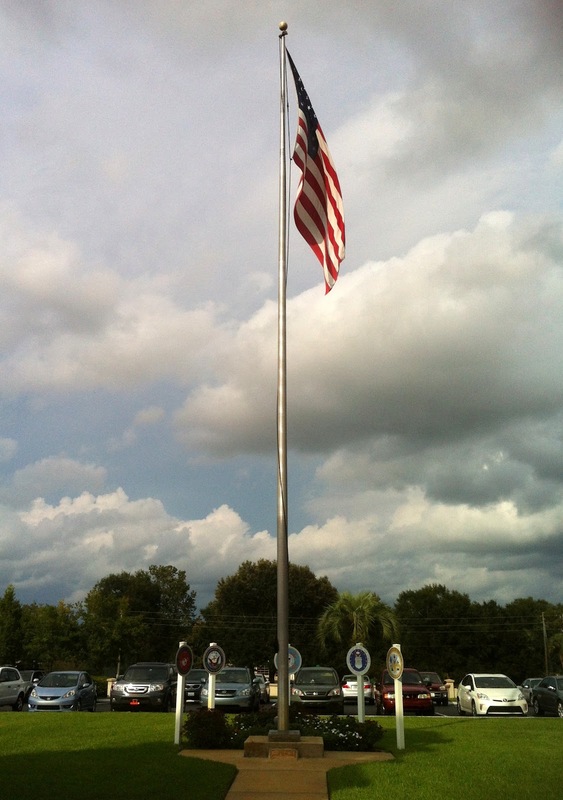 At the base of the Flag are 6 pedestal mounted plaques, one for each of the branches of Military Service. showing a photo of "Miracle on the Hudson" where he helped with rescue! 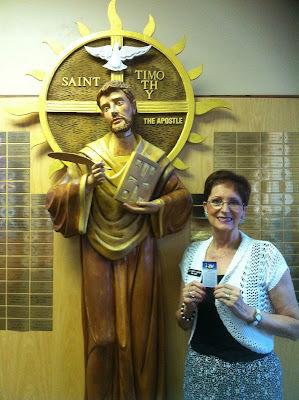 There were so very many special people and special moments we had during our time at St. Timothy's. Pictured above is a former FDNY and Coast Guard Serviceman who was not only involved in the 9/11 rescue but also in the Miracle of the Hudson. It was truly an honor to meet them. Among so many others was Tina who was awakened by the Lord in the middle of the night during a very difficult time of her life and was given Psalm 91 to pray. Psalm 91 got her through her trial in victory! 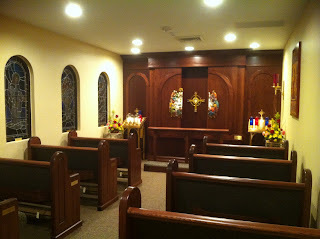 My favorite place is "The Last Supper Chapel", a former library, now a place of Divine Presence and peace. It is truly a very special hidden retreat. This is the legacy of Father Waters to the people of St. Timothy's Church. 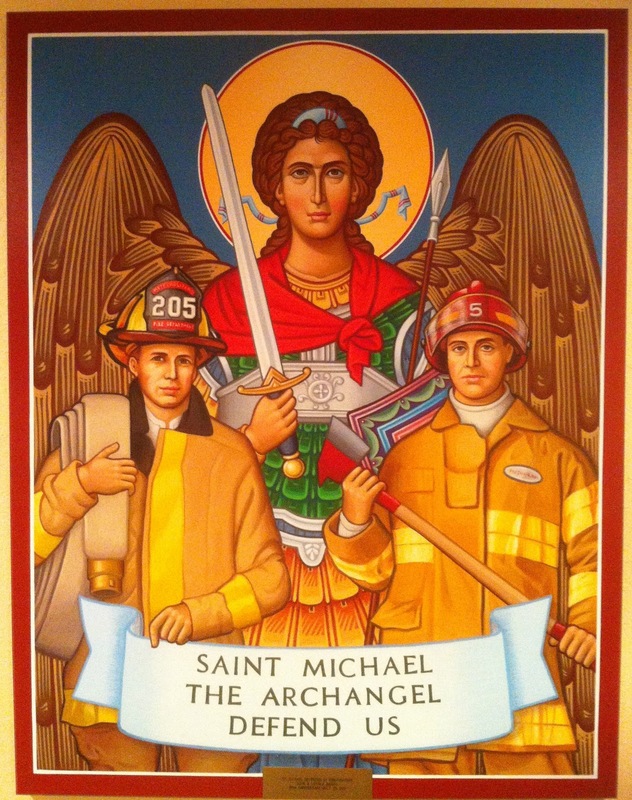 On the right wall of the Chapel is this beautiful piece of Art showing St. Michael the Archangel, Patron of Police and Firefighters. "Together we can do so much more than separately!" 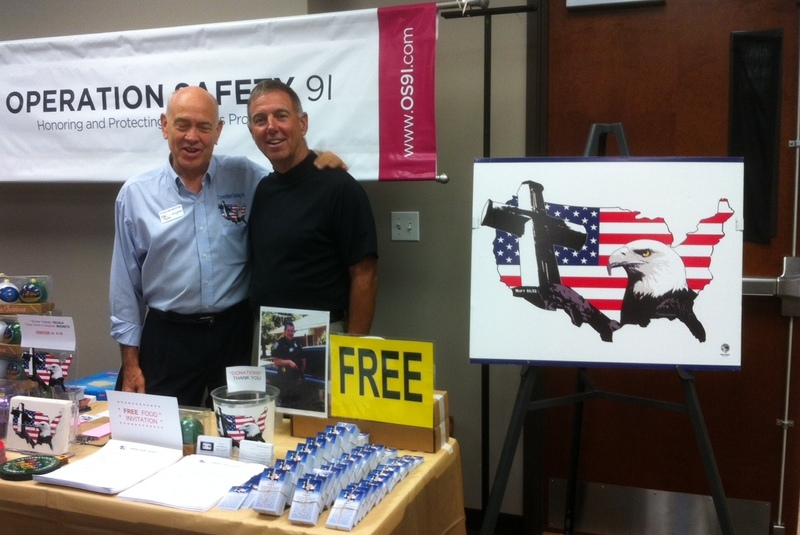 About one month ago, OS91 was contacted by a wonderful Pastor for an upcoming event his Church was sponsoring. We became very excited upon hearing the details. The Pastor is Pastor Earnest Edwards of Unity Christian Fellowship International Ministries located 2 miles from Redstone Arsenal in Huntsville, Alabama. This is the home of the AMC (Army Material Command), who had the first female 4 Star General stationed and commanded the AMC. 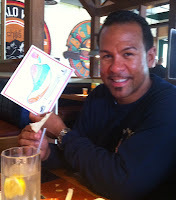 Even the children received Psalm 91 cards...let's get them started early! The Event was Community Outreach Fun Day which took place on September 1 from 11 am to 3 pm. 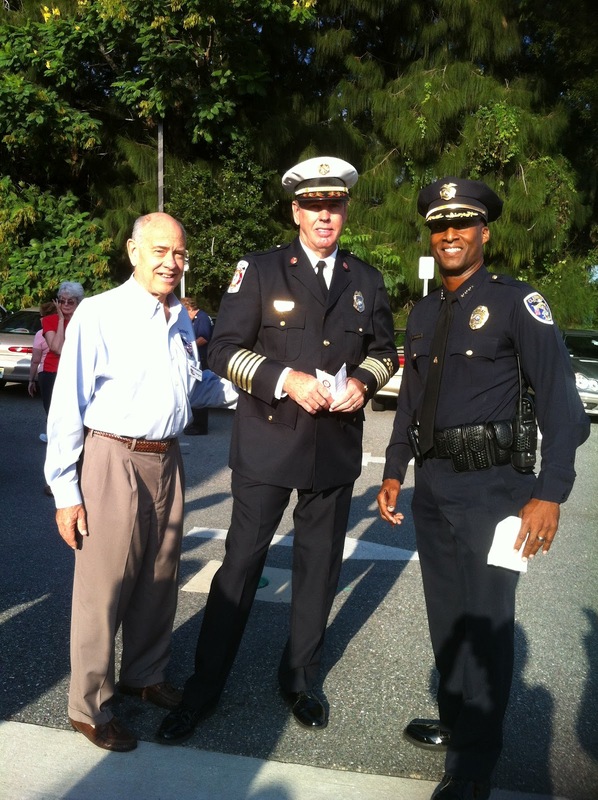 This was an outreach to the community, with special emphasis on the Police of Huntsville as well as the Military nearby. We so appreciate you, Pastor Edwards, your dear wife who made sure I received photos, as well as your Church's appreciation of those who protect and defend us daily. God bless you!